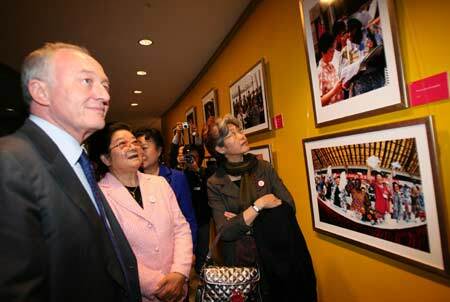 Gu Xiulian (2nd, L), vice chairperson of the Standing Committee of China's National People's Congress (NPC) and president of the All-China Women's Federation (ACWF) and the Mayor of London Ken Livingstone (L) visit the photography exhibition Women in China as a part of the China-UK Women's Cultural Festival in London, Britain, Feb. 11, 2008. The photography exhibition Women in China opened in London Monday, showcasing women's lives in modern China. From fashion, culture and entertainment to the Olympics, the exhibition of some 70 photos vividly presents to the British public the changing lives of Chinese women in the 21st century. Anyone with out-of-date preconceptions about Chinese women may quickly change their impression after seeing the modern, happy and intelligent Chinese women in the pictures. "This is the first time China holds an exhibition about women in Britain," said Gu Xiulian, vice chairperson of the Standing Committee of China's National People's Congress (NPC) and president of the All-China Women's Federation (ACWF), at the opening ceremony of the exhibition. "The photos show how Chinese women participate in the country's social and economic life, promoting harmony and progress. They also demonstrate women's aspirations for freedom, equality and happiness," she said. They are the symbol of goodness and tolerance, diligence and intelligence, Gu added. The exhibition, to run for 50 days, is an important part of the on-going China-UK Women's Cultural Festival, which is one of the highlights of "China Now" and "2008 China in London," the largest ever Chinese cultural season in Britain.